The plan today was to meet Paul Fernando and Pedro at the downtown farmers market. The Azores are still very much an agricultural based society, where farmers grow food, take their food to market, and sell the food to their friends, neighbours, and the public. 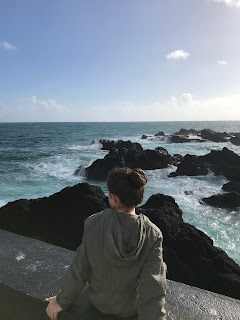 Ana’s folks emigrated from Sao Miguel in their mid-20’s and have lived in Canada ever since, returning to the Azores for visits maybe a total of five times over the years. Despite this, the last time we were here with Ana’s folks, her dad John and I visited this same market, and he knew and spoke with every second vendor, most of whom had been either been doing this for their entire lives or had taken over from their fathers when they had passed away. Traditions run deep here. The plan was to pick up the raw materials we need for the cozida (stew) we were going to cook for tomorrow - Easter Sunday. But this was going to be a very special stew as it was going to cook in the ground for six hours at a town called Furnas - a geothermal hot spot, located in the eastern part of the island. We bought an enormous quantity of meat including pork loins, beef, chicken, chorizo and blood sausages and then moved over to the vegetable section to get potatoes, carrots, kale, yams, and two other varieties of root vegetables I didn’t recognize. The price of the food was very reasonable, though not as incredibly cheap as I remember it being the last time we were here. We also browsed my favourite part of the market - the fish section, and found a decent variety of fishes, but didn’t purchase any as the meal tomorrow’s recipe called for meat only. Before leaving, we had to visit the cheese shop, which tucked into a far corner of the market. As you step through the door the pungent odour hits you like a cricket bat to the face, and you either relish the aroma, or cover your mouth and nose, depending on where you land on the cheese lover scale. I will admit, I am somewhat closer to the mozzarella end than the bleu cheese one, but I try my best. While we were browsing the cheese selection, I noticed an older man enter the store. He was wearing shabby clothes that may not have been cleaned in a while and was carrying a bun. He quietly walked over to the counter and stood at the side. One of the young men carving up cheese noticed him, gave him a nod, and then sliced off a thick slab and walked it over to the man and placed it inside his bun. I didn’t see any money change hands, but the man thanked him, bit into the sandwich, and then walked out of the store. Folks here do seem to take care of each other. We parted ways with Pedro and Paul and found a small cafe where we enjoyed hot drinks and pastries. Coffee here is always made from an espresso machine and never disappoints. And the pastries? Well let’s just say they’ve mastered the art of snacking, so you don’t often have to walk more than fifty steps to find a snack bar where they sell all types of them, as well as assorted styles of small, toasted meat and cheese sandwiches. The weather was cloudy and rainy, so we drove to the Parque Atlantico shopping mall for some indoor activity. A few months back, my father had visited mainland Portugal and purchased this nifty little mobile internet router, which he had loaned to me in case it also worked in the Azores. We found a store in the mall that did indeed support these devices, so we paid 15 euro for 30 gigs of data and had instant mobile internet. After a quick lunch back at home, we drove to nearby Lagoa to visit Ana’s aunt, who is also named Ana. She is the youngest sister of Ana’s dad and is the only one of the siblings living in the Azores - all the rest are in Canada. We stayed with her twice on previous visits here, but this time we didn’t tell her that we were coming so that we could surprise her. I parked the car tight up against her house and flipped in the mirror so that it didn’t get sheared off from a vehicle speeding by on the impossibly narrow road. We knocked on the door and then all stood there waiting, hoping she was going to be home. She opened the door wide and stood there for a couple of seconds looking at us, totally confused. Then her eyes shot wide open, her hand covered her mouth and she started crying. She then wrapped her arms around Ana and started laughing, and then did the same with the rest of us. It was very touching and an excellent surprise. Seeing Ana was especially important now as she had lost her husband only a month prior to our arrival and was still in the depths of her grief. We spent a lovely afternoon with her. Shortly after we arrived, two of the neighbourhood children stopped by to drop off an Easter cake for her, make by their mother. And then a while after that another neighbour, Ana-Maria, also stopped by to see her, so soon the dining room was full of people. Besides this the phone rang several times - friends calling to check up on her, so it was a real beehive of activity. The kids and I went out in the backyard to explore, as Ana has the greatest backyard ever - over an acre of banana trees, with a few other types of fruit trees mixed in - great for hide-and-go seek or just looking around, trying to identify the fruits. Our next stop was at the natural pools of Lagoa - in Portuguese they are called the piscinas naturais. Although not yet open for the season, we were still able to go in and wander around the facility. It is basically a series of natural lava rock pools of constantly refreshed ocean water with an additional two regular pools for swimming. Today the waves were crashing in, creating a sea of foam, quite unlike the summer days we have spent here on previous trips with calm water, dozens of local kids leaping into the water, and a strong sun beating down. Earlier in the day we had passed by our favourite restaurant on the island, called Beach Bar and Grill, and were happy to see that it was still open. We went there for dinner and enjoyed an excellent meal. Restaurant prices here are quite cheap - you can get a glass of beer for one euro, or a full bottle of wine for eight. Meals are cheaper than Canada too, perhaps 25% less. This restaurant is known for its hot plates, where they bring out a scorching hot flat lava stone and a raw piece of filet mignon that you cook on your own at your table. I decided to go with the fish instead, but we’ll be back for a steak before we leave. We spent the evening with the family at Ana’s cousin Carmelia’s house, which is just a short walk down the road from where we are staying. Her uncle was telling us stories about when he was a kid, including having to go barefoot to school, like most of the other kids, but when his parents could finally afford a pair of shoes for him, he was only allowed to wear them to church on Sundays. I asked Manuel if he thought things were better or worse now on the island compared to when he was a kid. He said things were obviously better, but two things were worse. First, people didn’t like to work anymore. If you have ever met an Azorean you will know they have a fierce work ethic and don’t take kindly to lazy people. Second, he said there is a huge drug problem on the island that is causing all sorts of trouble. Like anywhere, there is usually a price to pay for progress.